Objectives: The objective of this study was to investigate the expression pattern, functions, and possible mechanisms of RhoE/Rnd3, a novel member of the Rho GTPases family, in human esophageal squamous cell carcinoma (ESCC) cells by using molecular and cell-based experiments. Materials and Methods: Quantitative polymerase chain reaction and Western blotting were carried out to determine the mRNA and protein expression of RhoE in ESCC cell lines, respectively. Both 3-(4,5-dimethylthiazol-2-yl)-2,5diphenyltetrazoliumbromide (MTT) and flow cytometry were applied to evaluate the effects of RhoE overexpression on ESCC cell growth and apoptosis. Furthermore, Western blotting was used to test the expression of epidermal growth factor receptor (EGFR) and phosphorylated-extracellular signal-regulated kinase (p-ERK) in ESCC cells after RhoE was forced and expressed. Results: RhoE was downregulated in human ESCC tissues. Overexpression of RhoE inhibited cell growth as assessed by MTT assay and induced apoptosis. Importantly, we proved that RhoE could negatively regulate the protein expression of EGFR and p-ERK, suggesting that RhoE might inhibit ESCC progression through the EGFR/ERK pathway. Conclusion: Our data supported that RhoE could inhibit cell proliferation and promote apoptosis. Moreover, these tumor-suppressing effects might be acted through the negative regulation of EGFR/ERK signaling. In ESCC, Zhao et al. had reported that RhoE functions as a tumor suppressor and modulates the PTEN/PI3K/Akt signaling pathway. However, still little is known about whether other mechanisms correspond for its tumor-suppressing roles. The aim of this study was to examine the roles as well as other underlined mechanisms of RhoE in ESCC cells. Human esophageal epithelial cells (HEECs) were ordered from ATCC. The ESCC cell lines including KYSE-150, KYSE-410, Eca-109, and Ec-9706 (Cell Bank of Type Culture Collection of Chinese Academy of Sciences, Shanghai, China) were maintained in RPMI1640 supplemented with 10% fetal bovine serum at 37°C in a humidified incubator containing 5% CO2. Wild-type human RhoE proteins were amplified from cDNA of HEEC cells by polymerase chain reaction (PCR). And then, it was cloned into pcDNA3.1 vector without myc-tag in C-terminal. Ec-9706 cells were transfected with LipofectAMINE2000 (Invitrogen) according to the manufacturer's instructions. Total RNA was extracted by Trizol reagent (Life Technologies). Quantitative PCR (qPCR) was performed using a SYBR green method on ABI7500 system. β-actin was used as a normalized control. Total proteins were extracted by RIPA buffer plus with cocktail protease inhibitor (Roche) and other phosphatase inhibitors. Antibodies were from the following sources: RhoE, phosphorylated-extracellular signal-regulated kinase (p-ERK) and total-extracellular signal-regulated kinase (t-ERK) from Santa Cruz Biotechnology; epidermal growth factor receptor (EGFR) from Cell Signaling Technology; and β-actin from Sigma-Aldrich. 106 of Ec-9706 cells after transfections were harvested at 48 h and washed in phosphate-buffered saline (PBS), then fixed in 70% cold ethanol overnight at −20°C. After washing in cold PBS twice, cells were resuspended in 1 ml of PBS with 40 μg of propidium iodide and 100 μg of RNaseA at 37°C for 1 h. Then, the samples were subjected to analysis of their DNA contents by FACScan. 3-(4,5-dimethylthiazol-2-yl)-2,5diphenyltetrazoliumbromide (MTT) assay was performed to test cell viability. Ec-9706 cells transfected with pcDNA3.1 RhoE or control vectors were trypsinized and seeded into 96-well plates at a density of 1 × 103 cells in 200 µl of full medium each well. Then, the plate was incubated at 37°C with 5% CO2. MTT assay was performed each day for the next continuous 4 days. Absorbance at 490 nm (OD490) was detected by using a microplate reader. All experimental results in this study were from three independent experiments. The data were analyzed by two-sided Student's t-test using SPSS software (version 13, http://www-01.ibm.com/software/analytics/spss/). Summary statistics was expressed at means ± standard deviation. In all statistical analyses, P < 0.05 was considered statistically significant. To examine the roles of RhoE in ESCC, we first detected its mRNA expression in several selected ESCC cell lines. 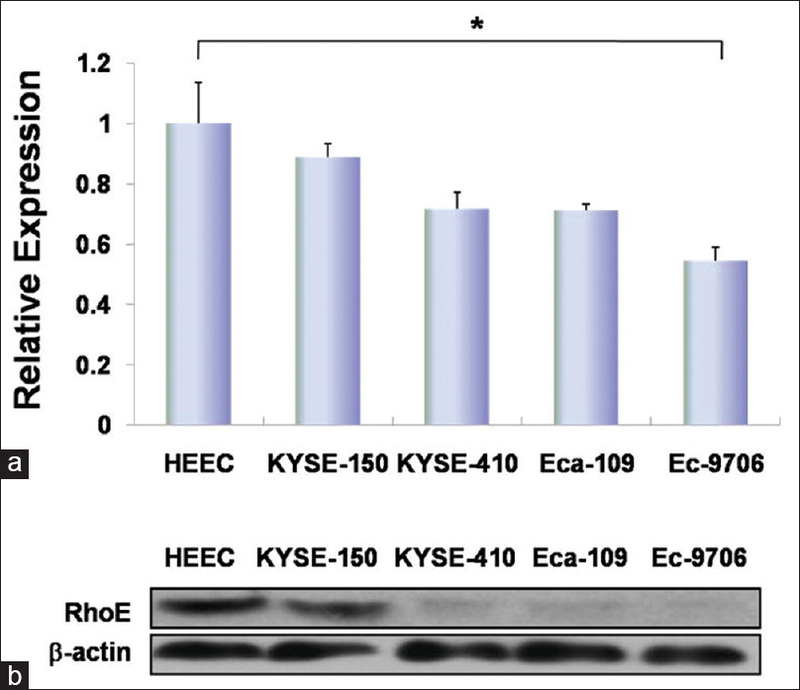 As shown in [Figure 1]a, compared with the immortalized HEEC, the mRNA levels in ESCC cell lines exhibited downregulation. Particularly, RhoE mRNA was most decreased in Ec-9706 cells, approximately 2-fold lower than that in HEEC cells. 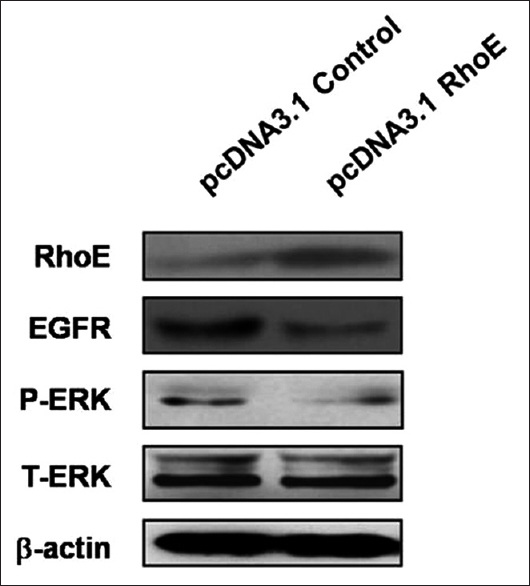 In addition, the protein expression of RhoE revealed the same obvious downregulation in ESCC cell lines [Figure 1]b. To investigate the biological function of RhoE in ESCC cells, we took Ec-9706 cell line as the in vitro model, since RhoE was expressed at a low internal level. pcDNA3.1–RhoE or control pcDNA3.1 vector was transiently transfected into Ec-9706 cells, the elevation of RhoE protein was validated by qPCR and Western blotting [Figure 2]a and [Figure 2]b. Twenty-four hours later, cells were seeded into 96-well plates, and MTT assay was applied to analyze cell growth rate. We found that heterogeneous expression of RhoE in Ec-9706 cells led to a slower growth rate compared with that in Ec-9706 cells transfected with empty vector pcDNA3.1 [Figure 2]c. Moreover, flow cytometry experiments demonstrated that RhoE overexpression could induce apoptosis as shown in [Figure 2]d. These results suggest that a high dose of RhoE could inhibit cell growth and induce cell apoptosis in ESCC cells. Next, we studied the underlined mechanisms that are responsible for the growth-suppressing and apoptosis induction effects of RhoE in ESCC cells. It is well known that the EGFR is a key cellular receptor which has been implicated in many cancers. Upon binded by ligands, the monomeric EGFR leads to dimerization and autophosphorylation, which consequently allows for the docking of adaptor proteins that initiate downstream signaling, including Ras/Raf/MEK/ERK/MAPK signaling and PI3K/PDK1/Akt signaling. We next investigated whether the key factors of EGFR/ERK signaling pathway could be regulated by RhoE. As shown in [Figure 3], we found that overexpression of RhoE could downregulate the protein expression of EGFR as well as p-ERK, whereas the t-ERK level remained constant, which indicated that RhoE might inhibit ESCC progression through the EGFR/ERK pathway. 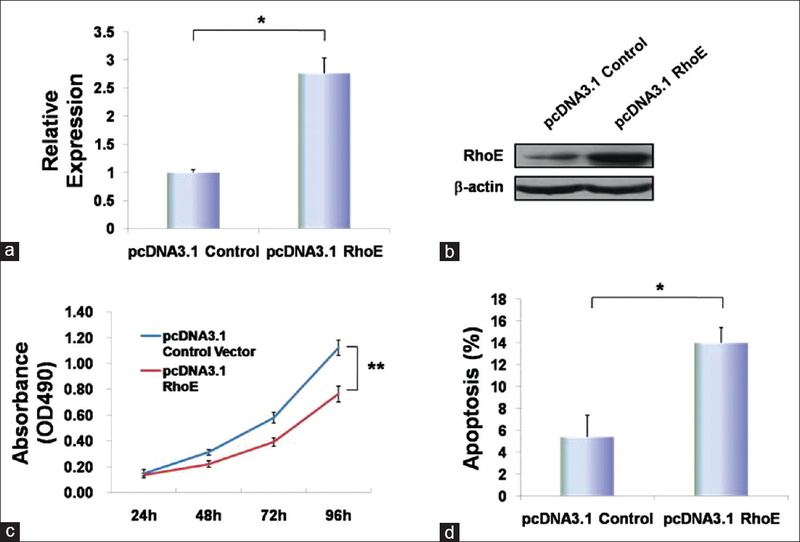 Here, we reported that RhoE was downregulated in ESCC cell lines, and we also found that RhoE could inhibit cell proliferation and promote apoptosis. Moreover, these tumor-suppressing effects might be acted through the negative regulation of EGFR/ERK signaling. Previously, RhoE expression was also reported as low in ESCC tissues and cell lines, it was suggested to function as a tumor suppressor by influencing cell proliferation, cell cycle progression, as well as cell invasion in vitro, and inhibited cell apoptosis. Therefore, our results presented in this study seems redundant, but still prove that the tumor-suppressing effects of RhoE in ESCC were true. However, we provided another possibility that EGFR/ERK might be the acting pathway by RhoE in ESCC cells. There are controversial reports about the functional significance of RhoE in the development and progression of human cancers. Numerous studies indicated that upregulation of RhoE was observed in pancreatic cancer, colon cancer, and melanomas, suggesting RhoE functions as an oncogene. Nevertheless, RhoE expression was markedly decreased in prostate cancer and hepatocellular carcinoma. Complexity and diversity of the functions of RhoE in different tumors impelled us to investigate the role of RhoE in the development and progression of ESCC. As a member of Rnd subfamily of the Rho GTPases, RhoE is not regulated by the typical GTP/GDP cycle, but was thought to be regulated dominantly at the transcriptional level. In our study, we proved that the mRNA expression of RhoE was indeed reduced in ESCC cell lines. However, the mechanisms for this downregulation of RhoE transcription remain unknown. Notably, Chen et al. previously reported that epigenetic silencing of the RhoE promoter by hypermethylation occurred in gastric cancer. Whether this epigenetic modification exits in ESCC cells stay unclear. Our results suggested that RhoE is a potential tumor suppressor gene in ESCC cells by inhibiting cell growth and promoting apoptosis, and the effects of RhoE on cellular biological responses are tightly associated with the EGFR/ERK signaling pathway. The targeting of this pathway and RhoE may offer a new therapeutic approach for ESCC treatment. This study was financially supported by the Henan Provincial Education Science and technology research key Fund Project (No. 14A320081). Kamangar F, Dores GM, Anderson WF. Patterns of cancer incidence, mortality, and prevalence across five continents: Defining priorities to reduce cancer disparities in different geographic regions of the world. J Clin Oncol 2006;24:2137-50. Ekman S, Dreilich M, Lennartsson J, Wallner B, Brattström D, Sundbom M, et al. Esophageal cancer: Current and emerging therapy modalities. Expert Rev Anticancer Ther 2008;8:1433-48. Xing D, Tan W, Lin D. Genetic polymorphisms and susceptibility to esophageal cancer among Chinese population (review). Oncol Rep 2003;10:1615-23. Hiyama T, Yoshihara M, Tanaka S, Chayama K. Genetic polymorphisms and esophageal cancer risk. Int J Cancer 2007;121:1643-58. Lu SM, Su M, Tian DP, Deng WD, Zheng YL, Huang HH, et al. Characterization of one newly established esophageal cancer cell line CSEC from a high-incidence area in China. Dis Esophagus 2008;21:309-15. Edwards BK, Brown ML, Wingo PA, Howe HL, Ward E, Ries LA, et al. Annual report to the nation on the status of cancer, 1975-2002, featuring population-based trends in cancer treatment. J Natl Cancer Inst 2005;97:1407-27. Heasman SJ, Ridley AJ. Mammalian Rho GTPases: New insights into their functions from in vivo studies. Nat Rev Mol Cell Biol 2008;9:690-701. Chardin P. Function and regulation of Rnd proteins. Nat Rev Mol Cell Biol 2006;7:54-62. Poch E, Miñambres R, Mocholí E, Ivorra C, Pérez-Aragó A, Guerri C, et al. RhoE interferes with Rb inactivation and regulates the proliferation and survival of the U87 human glioblastoma cell line. Exp Cell Res 2007;313:719-31. Villalonga P, Guasch RM, Riento K, Ridley AJ. RhoE inhibits cell cycle progression and Ras-induced transformation. Mol Cell Biol 2004;24:7829-40. Fortier M, Comunale F, Kucharczak J, Blangy A, Charrasse S, Gauthier-Rouvière C. RhoE controls myoblast alignment prior fusion through RhoA and ROCK. Cell Death Differ 2008;15:1221-31. Guasch RM, Scambler P, Jones GE, Ridley AJ. RhoE regulates actin cytoskeleton organization and cell migration. Mol Cell Biol 1998;18:4761-71. Klein RM, Aplin AE. Rnd3 regulation of the actin cytoskeleton promotes melanoma migration and invasive outgrowth in three dimensions. Cancer Res 2009;69:2224-33. Zhao H, Yang J, Fan T, Li S, Ren X. RhoE functions as a tumor suppressor in esophageal squamous cell carcinoma and modulates the PTEN/PI3K/Akt signaling pathway. Tumour Biol 2012;33:1363-74. Mirone G, Shukla A, Marfe G. Signaling mechanisms of resistance to EGFR- and anti-angiogenic inhibitors cancer. Crit Rev Oncol Hematol 2016;97:85-95. Chen J, Zhou H, Li Q, Qiu M, Li Z, Tang Q, et al. Epigenetic modification of RhoE expression in gastric cancer cells. Oncol Rep 2011;25:173-80.